We are huge BLT sandwich fans. We are also huge sushi fans. After a morning spent heatedly debating which of the two we would like for lunch, we ultimately decided that we wanted both. 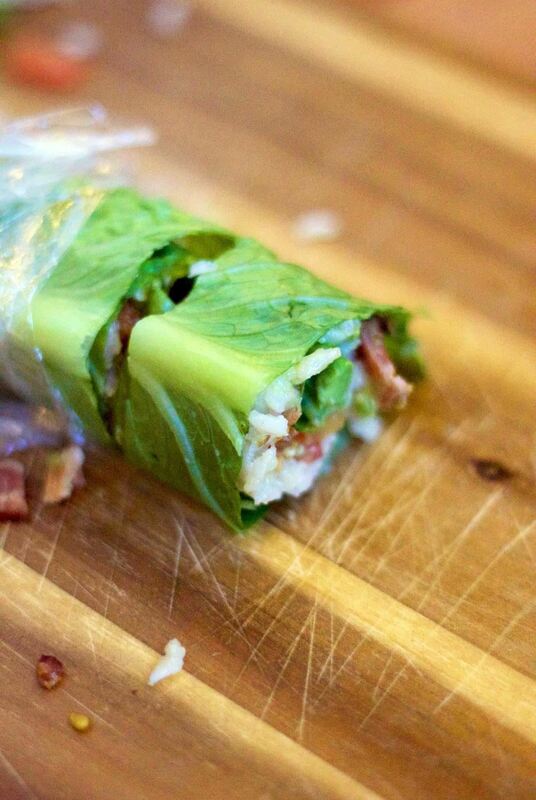 Thus, we created what we're not-so-cleverly calling 'The BLT Sushi Roll." 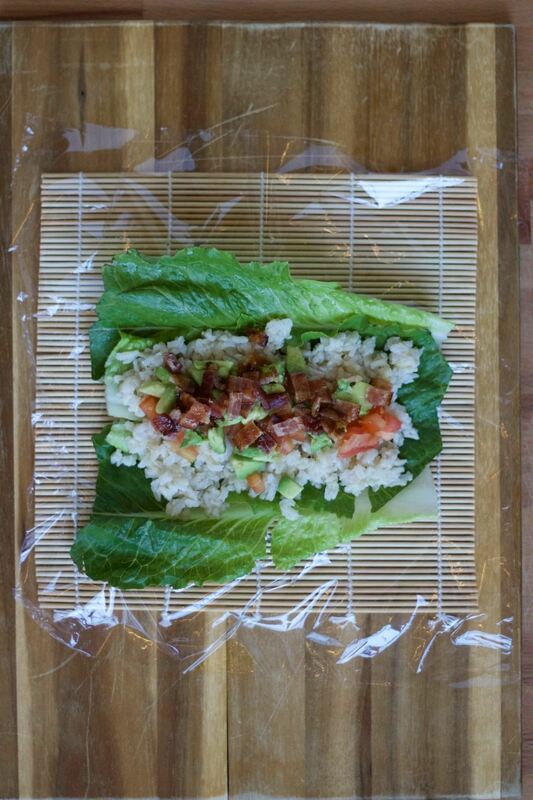 Pieces of thick romaine, a generous spread of cooked rice, a small pile of diced tomatoes and avocado (if you're feeling adventurous) and, of course, that bit of crunchy bacon, are what it takes to create your very own BLT sushi roll. 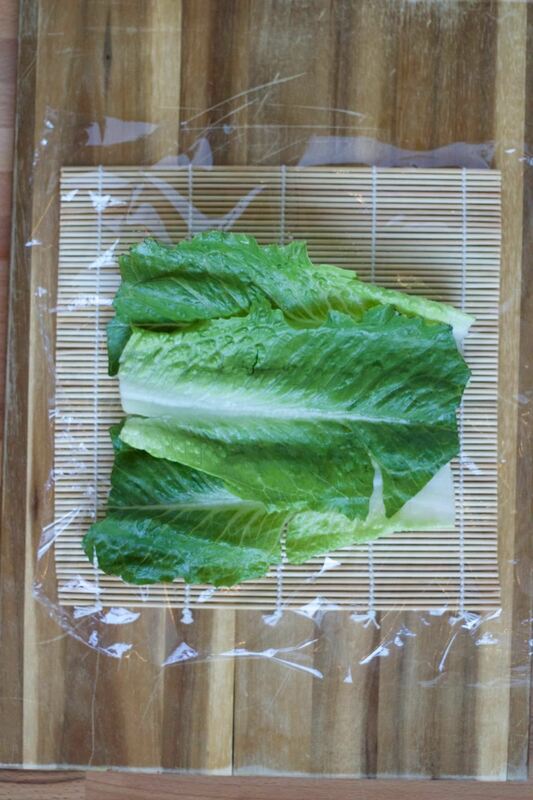 Prepare your rolling mat by placing plastic wrap over it to help prevent sticking, then lay your whole romaine leaves down flat as your base. 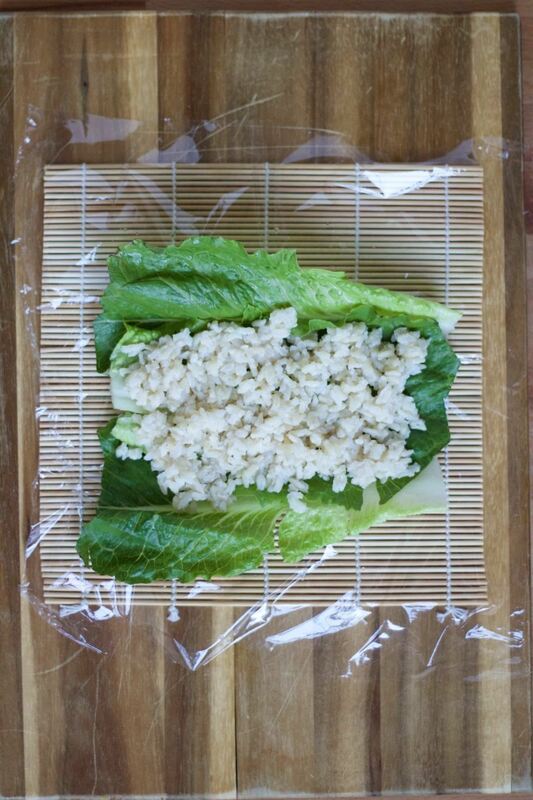 Spread your cooked rice evenly down the center of the lettuce. 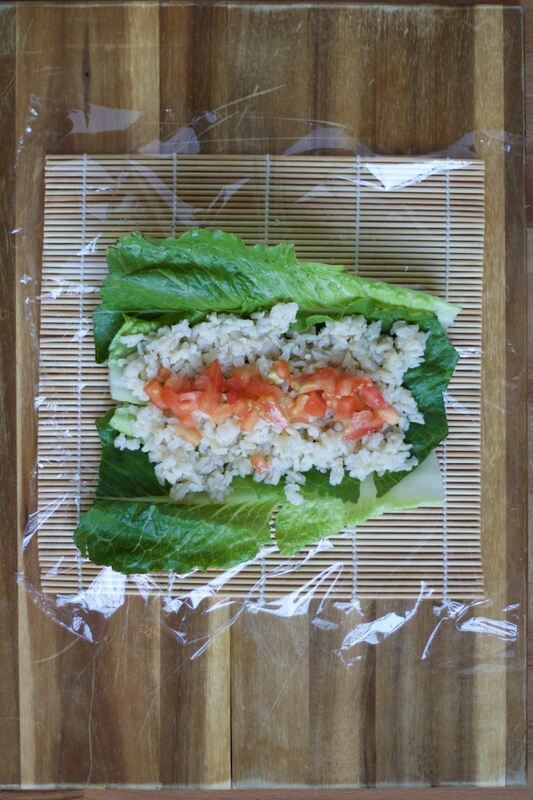 You want to leave a slight border all the way around so that when you roll the lettuce, the filling doesn't leak out the sides. Place the tomatoes strategically down the center of the rice, again leaving a border all the way around. Next, do the same with the avocado: place it right down the center. Make sure the pieces of avocado and tomato are approximately the same size to ensure a beautiful appearance when the roll is cut. And finally, the key ingredient is added: bacon. As tempting as it is, don't overdo it with the amount of bacon you put in your sushi roll. You don't want it overwhelming the other flavors in the roll and, even with bacon, there can be "too much of a good thing!" Place your thumbs underneath the bamboo mat and lift up and over the filling, as demonstrated in the "How to Roll Sushi" article. Then roll gently, keeping the roll tight and intact. 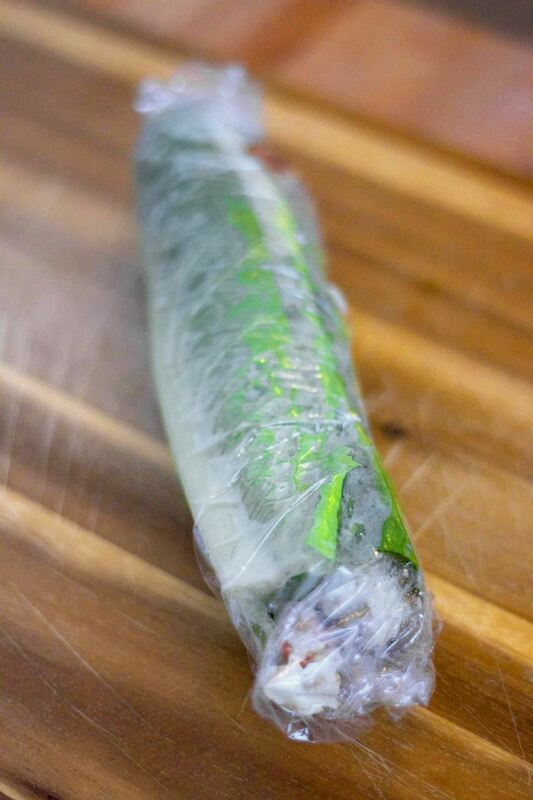 Once you have finished rolling, take the mat off and place the sushi roll in the fridge for 10 minutes to set. 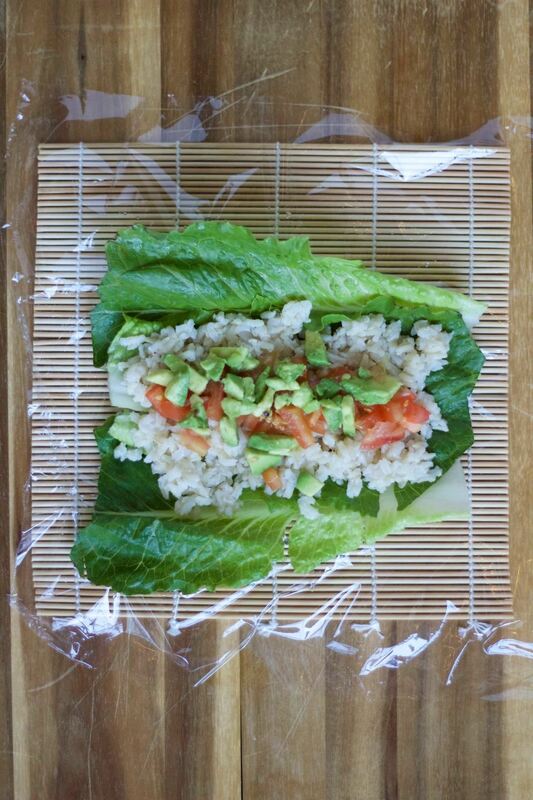 Take your roll out of the fridge and, with a sharp knife, cut it into pieces. Remove/roll back a little bit of the plastic wrap as you cut each piece. And there you go: your BLT Sushi is ready to rock 'n' roll in your mouth! Although we're definitely still perfecting the art of sushi making, we love the tastes and creative spin of this roll. It has us wondering how we could use sausage and scrambled eggs to create a breakfast sushi roll—it sounds delicious! Have you tried any spins on traditional sushi rolls of your own? Share them with us in the comments below!